That looks so inviting, Coral! I love Steven Wright’s quote…he’s a funny guy! Thanks so much for your comments womanwifemotherchild … I like your word ‘inviting’ for the packed books/bookshelves – and certainly bookshelves are always inviting to me! Glad you like Steven Wright’s quote – so funny (and a bit like my book at present…). Your books look so beautifully arranged, Coral. Methinks I shall have to put days aside to replicate the display of your teasure trove. They always look so inviting and pampered when placed perpendicular, no lazy books with acute or obtuse profiles. Thanks for the kind words John – but there’s another reason for the treasures so arranged: no more space. 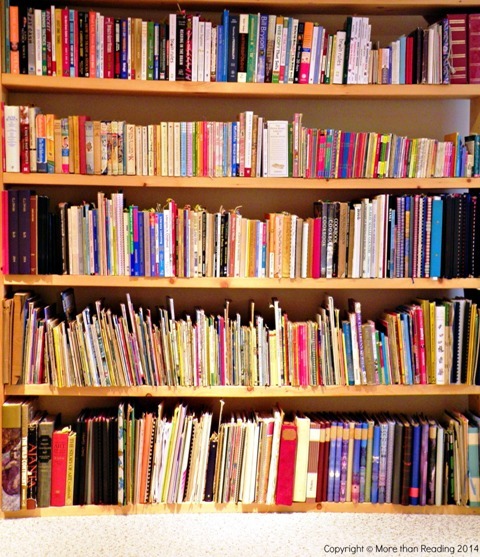 Bookshelves – the only things I know about interior decorating! Once again, there’s joy in your vivid description…’no lazy books with acute or obtuse profiles.’ Love it!